Parcels of land between Kingman and Ash Fork along I 40 are for sale for as low as $750 an acre. Yurts use compression and tension to form a freestanding, clear open structure. At the top of the yurt, the hub or compression ring is under pressure from the rafters, which radiate out from it. Could You Put a Yurt on Your Rural Northern Arizona Land? Why not, there have been several for sale in our area and i've seen used ones on Craigs List? Could You Put a Yurt on Your Rural Northern Arizona Land? Yes, you could! Click here for my blog on Building an Alternative Home and here for Teepees on rural land. 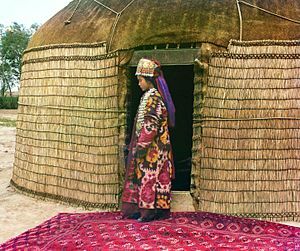 These yurts could provide great affordable homes. It seems like water and other utilities can come in from the platform. Liz, you're right. And here in Arizona you can have pole-mounted solar to provide electricity and you would be good to go. The more I look into these possibilities the more afffordable a second home becomes especially now with the price of solar dropping all the time.